We explained above that it is possible to save paths to be used later for an effect of your choice (option Add to Bin). However, a path saved in this manner may not be recovered after closing and re-opening TVPaint Animation. * The effects of the FX stack and their parameters may be saved in a Bin FX menu (see lesson 12). 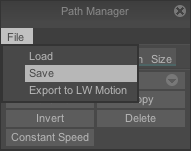 This save mode offers the advantage that it also stores the path(s) associated with your effect so that they may be recovered when re-starting TVPaint Animation. The saved path is that of the Manage popup menu, a loaded path will be added in the path bin and available in the popup menu of the Manage tab.